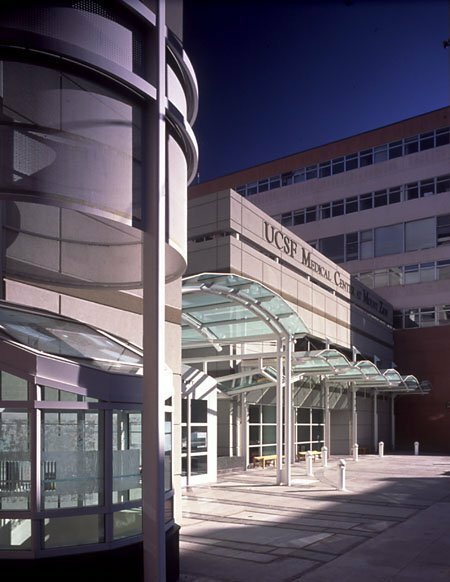 With its memorable entrance and efficient, technically rigorous facilities for medical needs, the award-winning cancer building at UCSF Medical Center befits its status as one of only 61 National Cancer Institute-designated treatment centers in the U.S. Design choices reflect the center’s image of permanence, warmth and well-being. 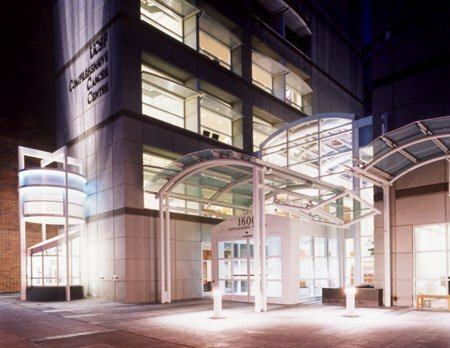 Radiation oncology, mammography and other clinics are accessible through a consolidated entrance with an inviting, cherry-trimmed reception area and meditation room. 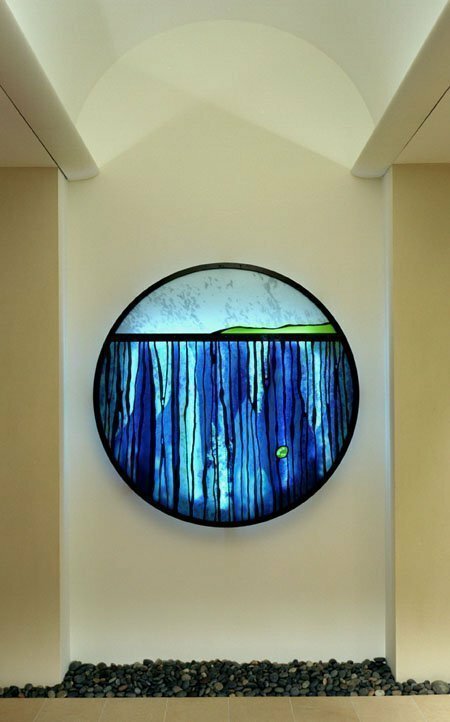 Rather than focusing on a single element, Huether became involved in a collaborative effort to integrate his nature-inspired work into the entire meditation room. 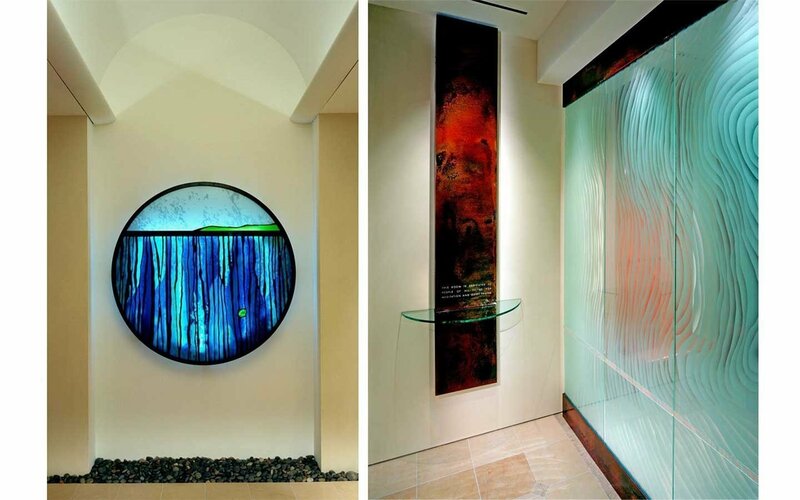 Upon entering the room, you are first faced with a delicately etched, water inspired glass wall and a patinated metal element designed to hold a small book in which to share your thoughts. 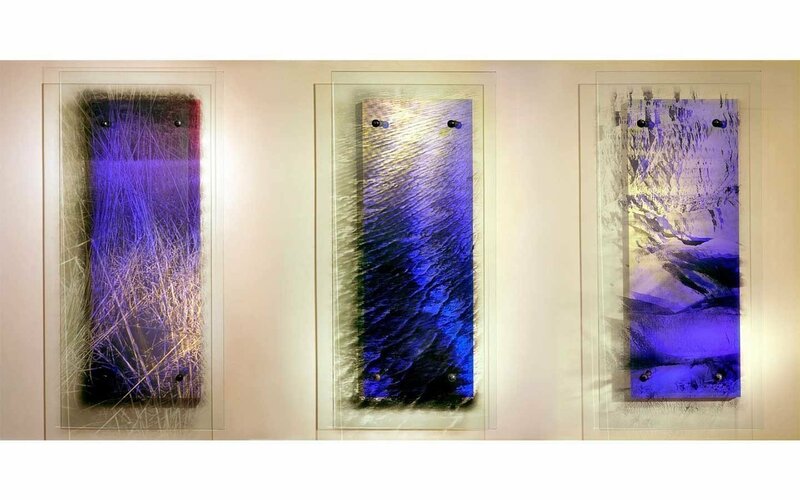 On the right-hand side, a photo transfer triptych (4’ H x 1’10” W x 3’D | Silk-screened Glass & Dichroic Glass) over dichroic glass shifts from blue to gold, depending on the angle of viewing. 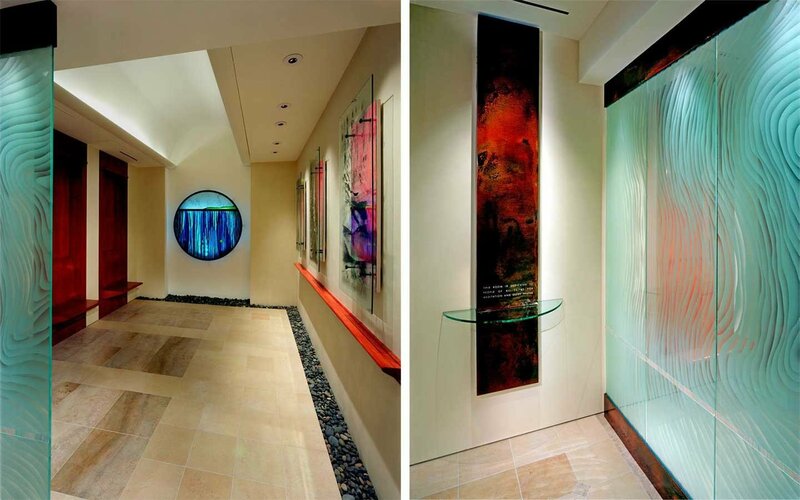 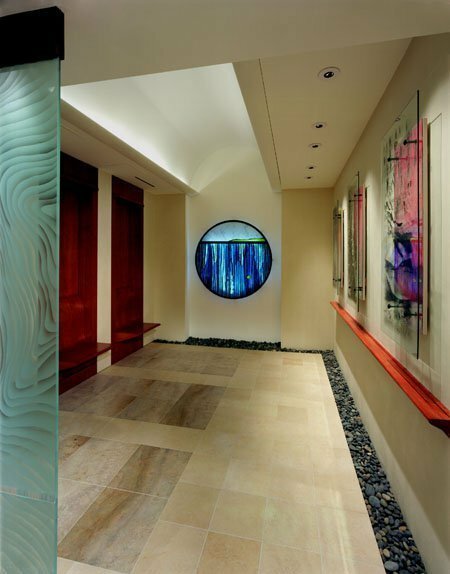 Past the glass screen, your eyes follow a river of rock leading to the focal point of the room, a floating, back-lit medallion (Medallion – 5’6” diameter). 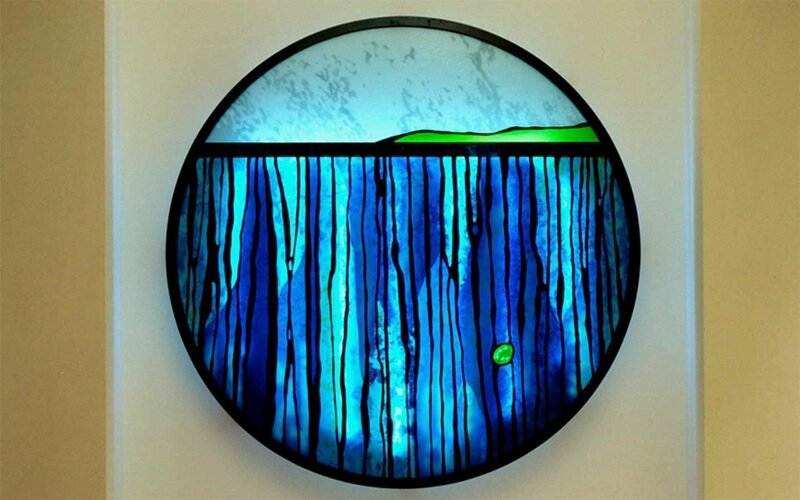 The landscape-inspired medallion uses soothing blue glass to imply falling water and a beautiful mouth-blown white glass to represent the horizon. 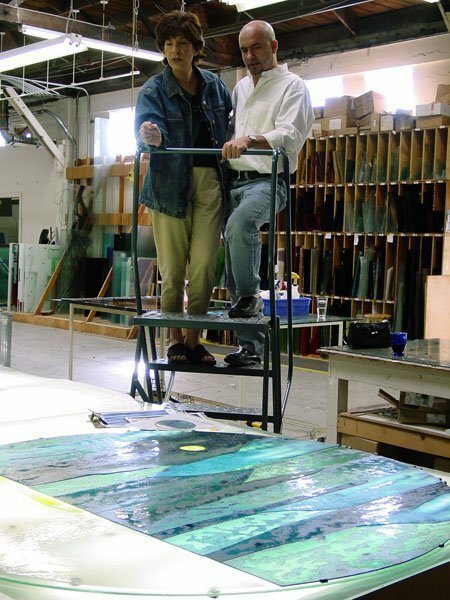 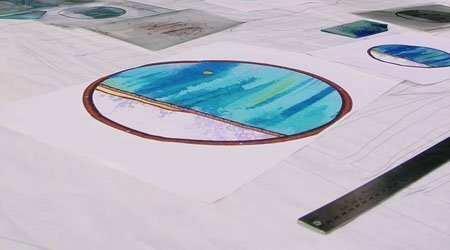 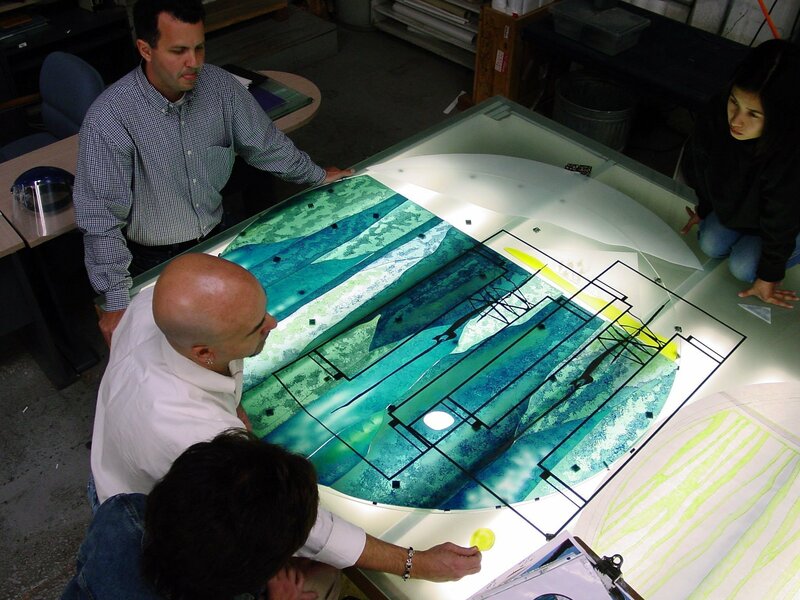 A lacy, water-jet-cut overlay of steel is laminated over the painted, etched and fused glass.